Hello crafty people! It's Laura here and today I am sharing a bright and happy card for the holidays. The October Release was huge, but of course I have a few favorite products. The line of Stampets simply make my heart happy. For this card I used the Stampets: Penguin set and colored Mister Penguin using Copic Markers. While I set him aside, I stamped tiny stamps from the Happy Christmas stamp set. There are so many images included in that set. Love it! Then, I added drops of gold shimmer spray for an extra festive effect. Afterwards, I adhered a strip of bold washi tape that I purchased at IKEA. I thought this card could use an extra something, so I sponged some lime green ink on the edges of the paper. That's it from me. Thanks so much for stopping by! Such a sweet card and the lime ink just makes everything POP! 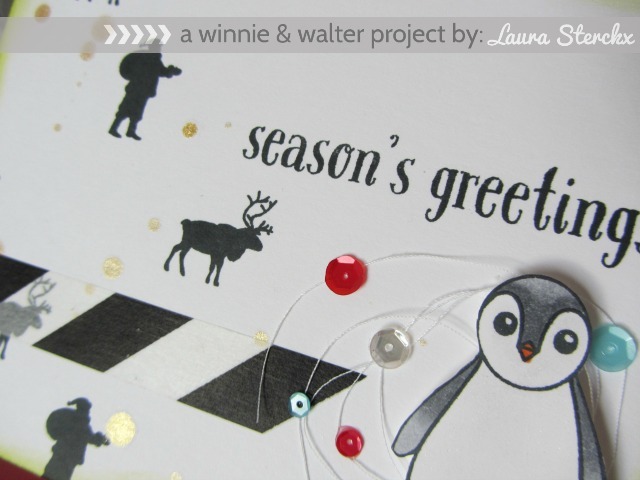 LOVE Mister Penguin and the tiny Christmas stamps, the lime edge looks AWESOME too!! !